Want real meat that's completely cruelty free? For the first time, scientists have grown a pork chop in a laboratory, a breakthrough that could lead to a future of meat that could be harvested without killing animals. Researchers at Eindhoven University, backed by funding from a sausage manufacturer and the Dutch government, have grown pork from cells harvested from a live pig. Although meat from goldfish has been grown from a lab, this is the first time mammal meat has been grown in-vitro. The researchers harvested myoblasts from the muscles of a live pig. These cells are programmed to repair damage and grow into muscle, and the team was able to culture a mass of muscle cells by incubating the myoblasts in a nutrient-rich "broth." The resulting meat is a bit soggy, and needs exercise to be as tough as the meat that comes from a once-living animal, but the team is looking for ways to "train" the meat and improve its texture. They are also looking to create a synthetic version of the incubation broth, which is current made from the blood products of animal fetuses. Laboratory rules prevent anyone from actually tasting the meat, so we don't yet known how the flavor of soggy, lab-grown meat compares to that grown on pigs. 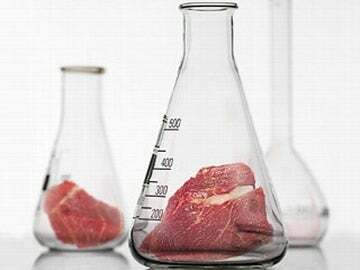 But the researchers believe that in-vitro meats could be available to consumers in as little as five years. Cue the references to Arthur C. Clarke's story "The Food of the Gods."